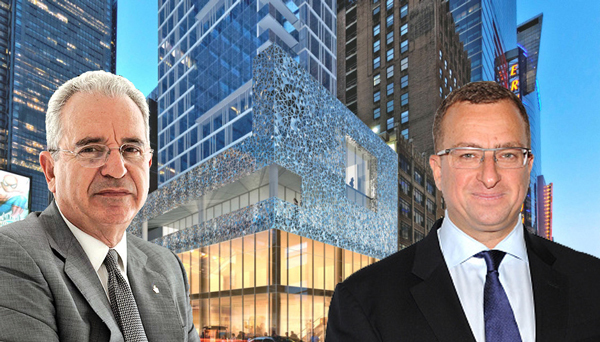 Eli Cohen, who sold off a Times Square-area office building for $53 million in 2015, has returned to the neighborhood to snap up the distressed note on Sharif El-Gamal and MHP Real Estate Services’ Dream Hotel development site, property records filed with the city show. Cohen’s purchase of the $63 million note from Colony Capital puts a large question mark on the future of the property at 560 Seventh Avenue, which has been in default since earlier this year. Cohen did not respond to requests for comment, and representatives for El-Gamal’s Soho Properties, MHP and Colony Capital each declined to comment. In an article dated April 25, The Real Deal had misidentified the buyer as Hidrock Properties, but records filed with the city late last week show that Cohen closed on the purchase of the debt on May 11. Cohen’s acquisition, financed in part by hard-money lender W Financial, gives him the ability to foreclose on the site if he chose to do so. El-Gamal and MHP secured the $63 million loan from Colony when they purchased the site for $62.3 million in 2014. They added to the development site the next year when they purchased air rights for another $9.2 million. Along with the Chatwal family’s Hampshire Hotels, the partners planned to construct a 29-story mixed-use building anchored by a Dream Hotel. The project was valued at more than $300 million. But the borrowers defaulted on the loan after its maturity date of January 31, and Colony started shopping the note. Cohen, a home-curtains manufacturer who is perhaps best known for taking down the Kentile Floors sign in Gowanus, is familiar with the block. Nearly two years ago, he sold a 14-story office building around the corner from the development site at 215 West 40th Street for $52.5 million. Cohen’s plans for the site were not immediately clear.